Mackay developed a 20-mile, self-guided interpreted tour of its historic mining sites and structures, such as this mine tramway. Mackay’s Mine Hill Tour attracts hundreds of visitors each year. Mackay, Idaho, (population 540) was founded in 1901 to service the copper mining operations of the White Knob Mining Company. It was named after the company’s major investor, John W. Mackay. Situated at the end of the Oregon Short Line railroad, Mackay grew rapidly, as did mining operations throughout the Salmon River country of central Idaho. Through all the ups and downs of its mining history, Mackay remained an important terminal for rail shipments to the central Idaho region and for the export of ore, sheep, cattle, and agricultural products. Today, nearly 60 years after the end of the mining heyday and subsequent loss of the railroad, Mackay has survived, mainly as a result of a consistent ranching industry, the nearby Idaho National Laboratory, the area’s scenic beauty, and a variety of recreational opportunities. 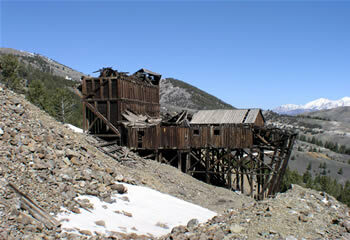 In 2004, Mackay developed a 20-mile, self-guided interpreted tour of its historic mining sites and structures. Mackay’s Mine Hill Tour attracts hundreds of visitors each year to view the ruins of the Cliff City Smelter, the 1918 White Knob aerial tramway towers, the Shay railroad trestle, and sites of early miners’ camps and cabins. Mackay hosts an annual free barbeque, “Tons of Meat, It’s Mackay’s Treat.” The celebration has been held every year since 1935, when Mackay gained control of the earthen dam above the town and its valley-wide irrigation system. Another community celebration is the Heritage Fest, a week-long event that emphasizes the valley’s ranching and livestock heritage.